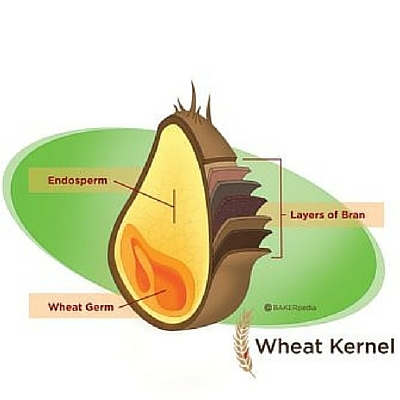 A cross-section diagram of the wheat kernel depicts its three components. What is the wheat kernel? The wheat kernel, or wheat berry, is the grain portion of the wheat plant and the source of flour. It consists of three main parts – the endosperm, bran and germ – which are usually separated for different flours and uses. There are over 30,000 wheat varieties, the most common being hard and soft red wheat. White wheat is also popular, while rare varieties include purple, black, brown, or green and gray wheat. The kernel’s size generally ranges from 5 to 9 mm long and weighs between 35 to 50 mg.1 Wheat kernels are sold raw, dry, pre-cooked, frozen, or most commonly as flour. Wheat began as a wild grass, although its exact geographical origin is unknown. Some theories point to ancient Mesopotamia or along the Euphrates and Tigris river in Egypt as its birthplace. However, most ancient languages include a mention of wheat.The earliest known records of wheat cultivation are by Swiss lake dwellings in 6700 B.C. China began cultivation around 3000 B.C. Early milling practices involved grinding the entire wheat kernel between two large stones. Wheat has been in the U.S. since colonial times. However, it was during the late 1800s that its cultivation and production took off. Red Wheat varieties were introduced in Kansas by Russian immigrants, and it soon became the staple crop of the American farm land. Whole grain flour is made by grinding all three parts the wheat kernel together. Whole wheat flour grinds the bran, germ and endosperm separately, and then mixes them altogether in the end. These two flours naturally include the complete nutritional benefits of the kernel, such as fiber, protein, minerals, and antioxidants. However, whole grain flours characteristically have low water-retention when used in products. White flour is made from only the endosperm. Enriched wheat flour adds back some of the nutrients lost from the bran and germ, and then some, during an enriching stage. These flours are a good source of iron, B vitamins, and complex carbohydrates, with some having twice the folic acid of whole wheat products. Sprouted flour or mashes stimulate the germ portion of the kernel to sprout before it is milled into flour. This process increases the kernel’s bioavailability and cracks the outer husk of the bran layer. Sprouted products have some increased digestibility and nutritional value compared to whole grain or enriched grain products. Gegas, V. C., A. Nazari, S. Griffiths, J. Simmonds, L. Fish, S. Orford, L. Sayers, J. H. Doonan, and J. W. Snape. “A Genetic Framework for Grain Size and Shape Variation in Wheat.” The Plant Cell 22.4 (2010): 1046-056. Xie, Xueju (Sherry), Steve W. Cui, Wei Li, and Rong Tsao. “Isolation and Characterization of Wheat Bran Starch.” Food Research International41.9 (2008): 882-87. Kalinga, Danusha N., Renuka Waduge, Qiang Liu, Rickey Y. Yada, Eric Bertoft, and Koushik Seetharaman. “On the Differences in the Granular Architecture and Starch Structure between Pericarp and Endosperm Wheat Starches.” Starch – Stärke Starch/Stärke 65.9-10 (2013): 791-800. Rizzello, Carlo Giuseppe, Luana Nionelli, Rossana Coda, Maria De Angelis, and Marco Gobbetti. “Effect of Sourdough Fermentation on Stabilisation, and Chemical and Nutritional Characteristics of Wheat Germ.” Food Chemistry 119.3 (2010): 1079-089. Bramble, Tod, Timothy J. Herrman, Thomas Loughin, and Floyd Dowell. “Single Kernel Protein Variance Structure in Commercial Wheat Fields in Western Kansas.” Crop Science 42.5 (2002): 1488. Sęczyk, Łukasz, Michał Świeca, and Urszula Gawlik-Dziki. “Effect of Carob (Ceratonia Siliqua L.) Flour on the Antioxidant Potential, Nutritional Quality, and Sensory Characteristics of Fortified Durum Wheat Pasta.”Food Chemistry 194 (2016): 637-42.